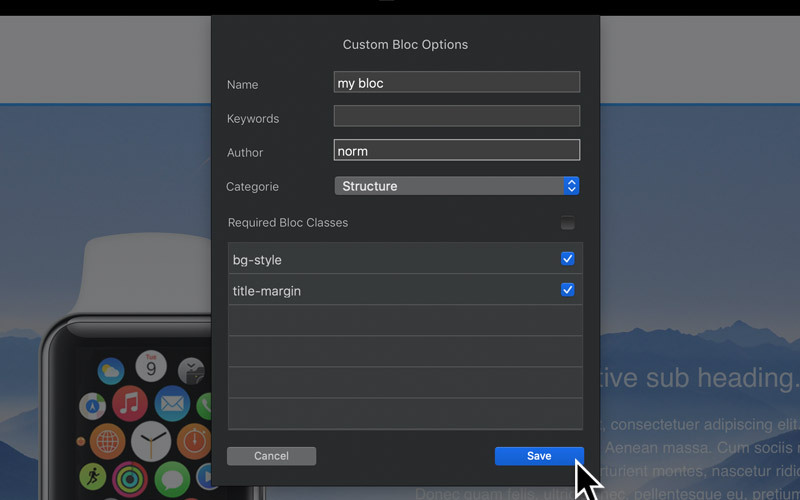 Blocs has the ability to store any layout that is created within the app as a custom Bloc. Custom Blocs dramatically speed up the process of creating layouts that you may use on a regular basis. All installed and saved custom Blocs are stored in the main Bloc library and can be accessed via the Bloc Bar. 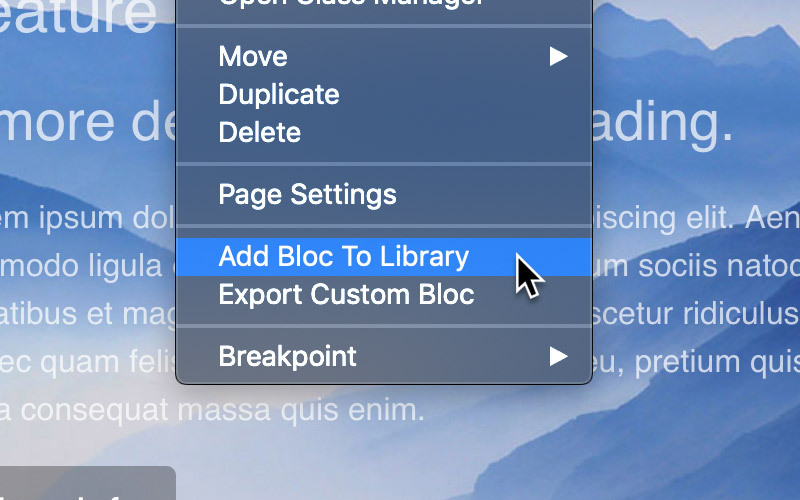 To store a custom Bloc, simply Right Click a Bloc on the design canvas and select Add Bloc To Library from the contextual menu, this will open the Custom Bloc Options sheet. From this sheet you can now give your custom Bloc a name, set its keywords (which are used when searching the Bloc library within the Bloc bar) and choose the custom classes you want included within your custom Bloc. By default Blocs will auto enable the checkboxes for all of the custom classes used in the currently selected Bloc for you. It’s a good idea, however, to double check the classes set to be included in case you would like to exclude or include any in particular. 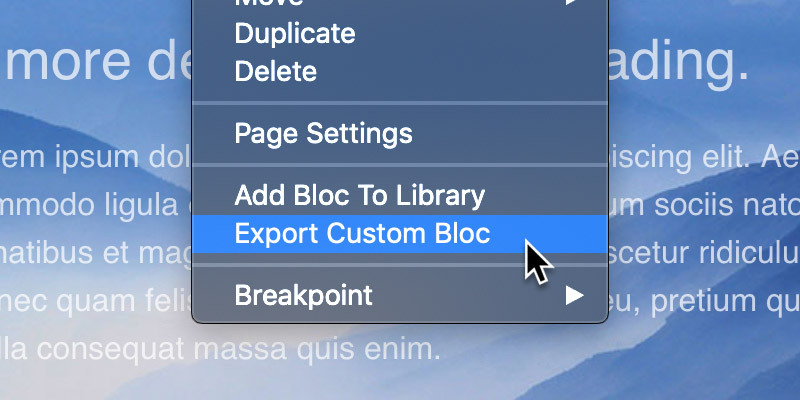 To export a custom Bloc, Right Click a Bloc on the design canvas and select Export Custom Bloc from the contextual menu or alternatively, with a Bloc selected, choose Blocs > Export > Export As > Custom Bloc from the main application menu. To Install a custom Bloc, simply navigate to the BEX file on your hard drive and then Double Click it while the main Blocs application is open. All installed custom Blocs are available via the Bloc Bar library. If you need to edit any of the values of a saved custom Bloc such as its category or keywords, you can do this via the Bloc editor. 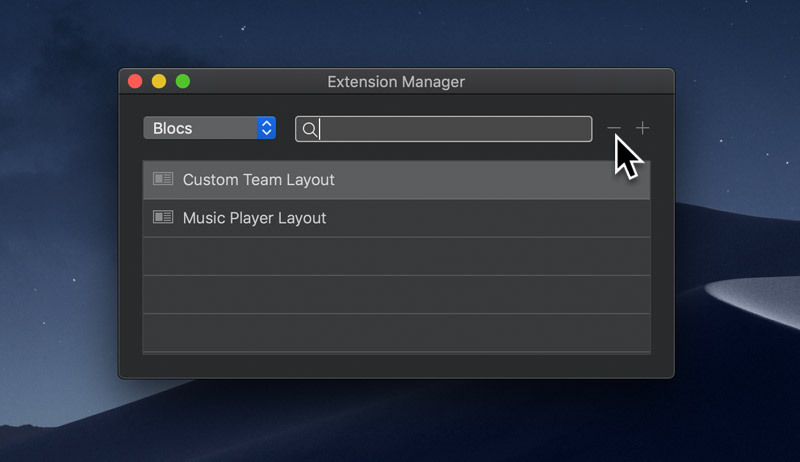 To uninstall a custom Bloc, open the Extension Manager via the main menu, Window > Extension Manager and then search for your custom Bloc. Once you have found it, select it and then click the button with the – symbol, located in the top right corner of the Extension Manager. All projects that use uninstalled custom Blocs may not work or display correctly, however, projects that have been exported to code prior to the custom Bloc being uninstalled will continue to function and display correctly.